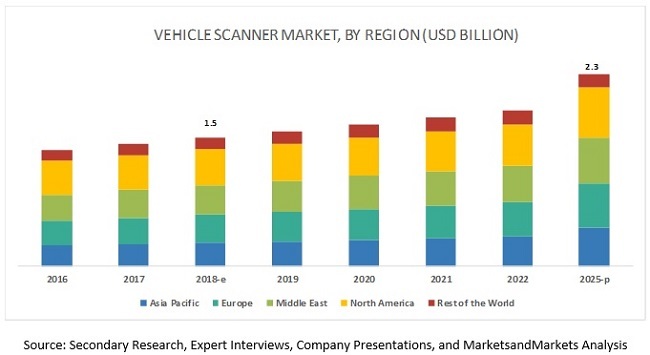 [131 Pages report] The global vehicle scanner market is projected to grow at a CAGR of 6.28% during the forecast period to reach USD 2.3 billion by 2025 from an estimated USD 1.5 billion in 2018. A significant focus on safety and security concerns by governments and private and commercial properties along with development in infrastructure are the key factors that have led to an increase in the installation of vehicle scanner systems. Further, the continuous rise in terrorist activities worldwide has also fueled the demand for high safety and security systems within countries. Governments and private and commercial properties are focusing more on the safety concerns to combat threats. To ensure safety and security, properties are installing under vehicle scanners and overhead X-ray systems for full vehicle body scanning. Drive-through vehicle scanners are also known as full body scanners. Governments, military premises, and highly restricted areas are now focusing on the installation of drive-through vehicle scanners. These systems mostly use X-ray technology to scan vehicles, which help in identifying bombs, drugs, contraband, and other possible threats. This system is best suitable for scanning large vehicles at places such as airports, seaports, tolls, oil plants, and cross-border checkpoints. Manufacturers such as Rapiscan provide drive-through full vehicle body scanning systems. The fixed/static segment market is the largest contributor due to the high adoption rate in countries such as the US, Saudi Arabia, Germany, and the UK. A fixed/static vehicle scanner is usually installed in permanent vehicle scanning checkpoints. It involves high installation cost as compared with the portable/mobile vehicle scanner system because fixed/static vehicle scanner is installed under the ground surface. The static vehicle scanner is capable of scanning the vehicle with speed ranging from 30 to 60 km/h. The system can scan, detect, and compare images automatically, making the security personal’s job easier, safer, and more effective. The growth of the government/critical infrastructure protection sector is estimated to be the largest market. There is a higher demand for vehicle scanner systems from government institutes to secure sensitive places such as nuclear plants and oil plants. Governments of various countries install vehicle scanner systems to safeguard various military bases, defense facilities, and cross-borders checkpoints. It also includes critical infrastructures such as nuclear power plants, prison facilities, and ancient monuments. North America is the largest vehicle scanner market. The North American market has huge potential for vehicle scanners because the region has developed infrastructure such as airports, seaports, and high security measures to combat illegal activities and terrorism. Further, the continuous rise in terrorist activities in the region has fueled the demand for high safety and security systems within many countries. Governments and private and commercial properties are focusing more on the safety concerns to combat threats. To ensure safety and security, properties are installing under vehicle scanners and overhead X-ray systems for full vehicle body scanning. To minimize illegal entries of vehicles at borders, RFID system and Under Vehicle Scanning System (UVSS) can be installed. Such factors are driving the vehicle scanner market in the North American region. 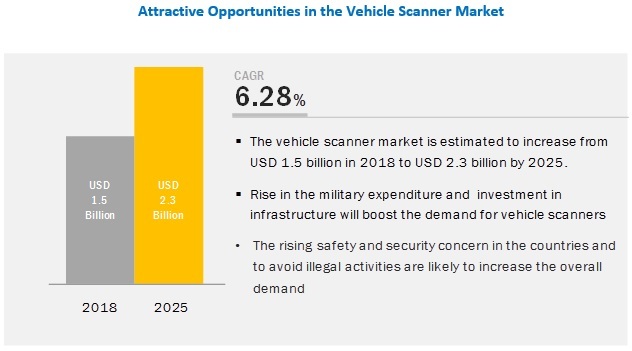 The global vehicle scanner market is dominated by major players such as Gatekeeper Security (US), SecuScan (Germany), UVIScan (Netherlands), Leidos (US), and IRD (Canada). These companies have strong distribution networks at the global level. In addition, these companies offer an extensive product range. The key strategies adopted by these companies to sustain their market position are new product developments, collaborations, and contracts & agreements. In April 2018, SecureOne International BV, which is the parent company of UVIScan, acquired the PlateCatcher brand and activities from Topguard/Heras Group. In November 2018, UVeye partnered with Toyota Tsusho Corporation to strengthen its presence in Japan for vehicle inspection with the help of AI. This system will be deployed in auction sites and used on Toyota‘s used cars. In December 2018, Roadway Electric LLC awarded a contract to International Road Dynamics (IRD) Company to supply and maintain a statewide port of entry truck screening system as part of a design-build project valued at USD 2.8 million for the Arizona Department of Transportation. IRD will supply and supervise the installation of the truck screening system at 5 locations throughout the state, including Ehrenberg, Topock, Sanders, San Simon, and Parker Weigh stations. IRD will maintain the systems for 5 years as part of this contract. Which are the major components in vehicle scanner system? Will the industry cope with the challenge of high cost of vehicle scanners? How do you see the impact of security issues in the vehicle scanner market? What are the upcoming trends in the vehicle scanner market? What impact do they make post 2020? The study involved 5 major activities in estimating the current size of the vehicle scanner market. Exhaustive secondary research was done to collect information on the market, peer market, and parent market. The next step was to validate these findings, assumptions, and sizing with industry experts across value chains through primary research. The top-down approach was employed to estimate the complete market size. Thereafter, market breakdown and data triangulation were used to estimate the market size of segments and subsegments. The secondary sources referred to for this research study include safety & security industry organizations such as the Organization for Security and Co-operation in Europe (OSCE), United Nations Counter-Terrorism Implementation Task Force (CTITF), corporate filings (such as annual reports, investor presentations, and financial statements), and trade, business, and automotive associations. Secondary data has been collected and analyzed to arrive at the overall market size, which is further validated by primary research. Extensive primary research has been conducted after acquiring an understanding of the vehicle scanner market scenario through secondary research. Several primary interviews have been conducted with market experts from both the demand-side system integrators, distributors, system installers [(in terms of component supply), country-level government associations, and trade associations], and supply-side vehicle scanner and component manufacturers across major regions, namely, North America, Europe, Asia Pacific, the Middle East, and the Rest of the World. Approximately, 19% and 81% of primary interviews have been conducted from the demand and supply side, respectively. Primary data has been collected through questionnaires, emails, and telephonic interviews. In the canvassing of primaries, we have strived to cover various departments within organizations, such as sales, operations, and administration, to provide a holistic viewpoint in our report. After interacting with industry experts, we have also conducted brief sessions with highly experienced independent consultants to reinforce the findings from our primaries. This, along with the in-house subject-matter experts’ opinions, has led us to the findings as described in the remainder of this report. 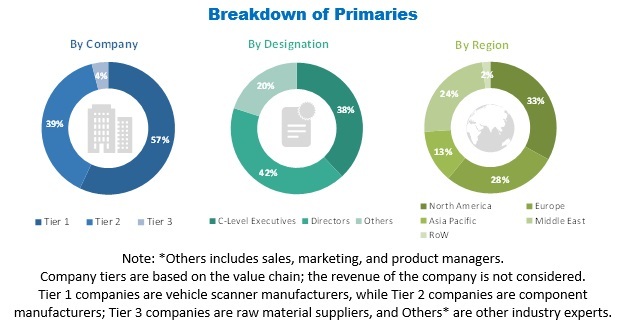 The top-down approach has been used to estimate and validate the size of the vehicle scanner market by scanner type, application, structure, component and region, in terms of value. In this approach, the global vehicle scanner market size is derived by calculating the segmental revenue of vehicle scanners for key market players. After deriving the total market size, the market share of each region is identified. Regional market is derived by multiplying regional penetration with global market. To calculate the country-level vehicle scanner market, mapping of government and commercial facilities has been done to identify the penetration ratio for each country in their respective regions. To derive the country-level vehicle scanner market, penetration ratio for each country is multiplied by the total market of that particular region. All country-level data is added to derive the global vehicle scanner market, by application, structure, and scanner type. This research report categorizes the vehicle scanner market on the basis of scanner type, scanner structure, component, application, technology, and region.